Compatibility: Twist on F Connector ideal for connecting SKY HD & SKY Q digital satellite receivers, TV, cable boxes, Freesat and antenna cable systems. The center pin offers corrosion resistance. 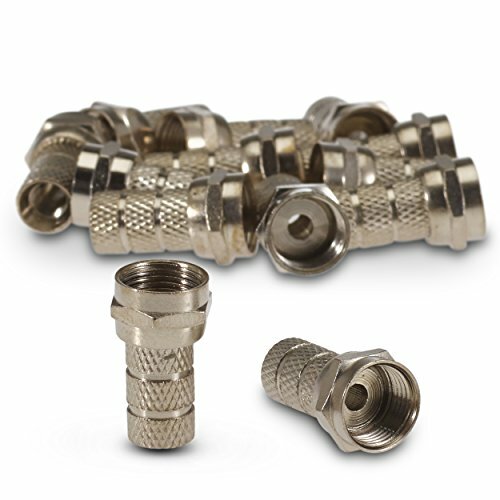 F Connector Diameter: Nickel Plated F Plug Connectors with an Internal Diameter 4mm prevents sharp bends in the cable that could shorten its life span or create a poor quality signal. Excellent Quality: High quality, weather resistant material F-connectors that provide a smooth and consistent seal to reduce signal leakage and prevent moisture penetration for maximum signal reliability and performance to ensure no loss to picture or sound quality. Removable Connectors: Connectors are easily removable by hand and fit them back on if you wish to push through a wall or cut cable to the perfect size. It Includes 5 x F-type connectors to connect to existing cables for moving your sky or freesat box. Easy Installation: SSL F-type connectors simply strip cable as normal and Twist-On connectors for connection to the cable without using a special crimp plier. We know that loose connectors have been with us for as long as connectors have existed. A loose connector creates a potential source of signal leakage and ingress. SSL F Connectors are perfect for cable with 4mm diameter. They are weather-resistant, making them ideal for cables that run outside to a cable or satellite box. They are also resistant to corrosion and normal wear that may take place, inside or out. 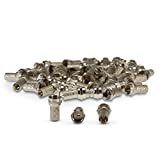 This F Plug connector is used for attaching to standard satellite or coaxial cable, thus enabling the cable to be plugged into a device such as a sky or virgin box. The connector has nickel plated contacts for an improved connection and can be used very easily by screwing onto the cable. 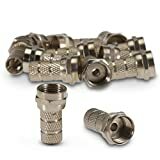 The f coax connector is a coaxial RF connector used for "over the air" cable television and universally for satellite television and cable modems, usually with CT63 cable or, with WF65/63 cable. 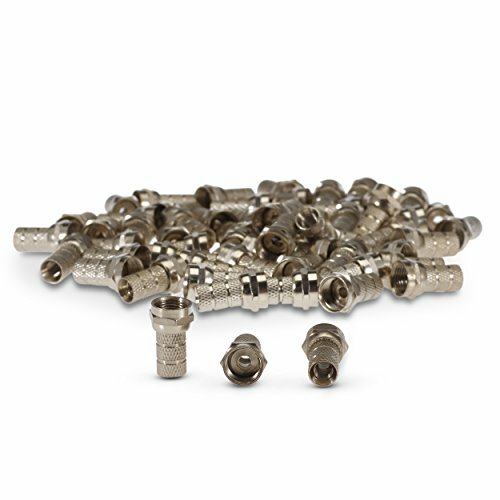 Easily connect cables or replace broken plugs with these coaxial cable F connectors suitable for twin cables 4.2mm - 4.6mm outer diameter designed to terminate coaxial cables at custom lengths to meet your wiring needs.